Your website is your dental practice’s most fundamental digital marketing tool -- but are you making the most of that digital real estate? In order to be effective, you’ll first need to make your website easy for people to find via a Google search for dentists in your neighborhood (e.g. “chelsea nyc dentist”). However, optimizing your website to rank well on Google searches can be more of an art than a science. To learn from the best, we analyzed the top-ranking dental websites for five competitive location-based Google searches. We chose to focus on the top 2 cities on SoftwarePundit’s list of Best Cities for Dentists (Tacoma, WA and Kokomo, IN), and the three most populous cities in the U.S. (New York, Los Angeles, and Chicago). In this article, we’ll highlight tips and tricks that we can learn from each of these high-ranking websites, and explain how you can apply these lessons to your dental practice’s website. What we like: Advanced Dental Care's website repeats its location (Tacoma) 15 times throughout the main website’s text, but it does so in an effective way that doesn’t look too repetitive. For example, one of their section headers says "Tacoma Patients Testimonials", rather than simply "Patients Testimonials". Generally, the more ways you can find to naturally include your practice's location throughout your website (wherever it makes sense), the more likely it is that your practice will be associated with that particular location in a Google search. The practice also has the location in the website's domain name, which is a nice plus. The takeaway: People who are searching online for a new dentist will most likely include the name of their city in the search query. Therefore, you should try to target these location-based searches by including your practice’s location within your website's copy wherever possible. Identify missed opportunities, and update your website text accordingly to let people (and Google) know exactly where your practice is located, and what locations you serve. Search rankings are a tough nut to crack, so there’s no guarantee that this type of change will have any effect on your practice’s ranking. However, we do recommend trying it out, because you have nothing to lose, and potentially a lot to gain. What we like: Markland Family Dental’s website displays 200 patient reviews in a widget via NRC Health, a reputation management company in the healthcare space. This is a great way to give visitors a positive window in the practice’s credibility, and may help convince potential patients to make the leap and set up an appointment. Visitors who are scouting out a dentist’s website for the first time will inevitably look for authentic patient reviews before deciding to book their first appointment. Testimonials are valuable as well, but they can often come across as rehearsed/polished. In contrast, actual patient reviews on your site help add a sense of authenticity to your practice's website. Displaying reviews prominently on your website will also help encourage visitors to stay on your website instead of searching elsewhere (such as Yelp) for reviews of your practice. The takeaway: If you’re not doing so already, try to ask your most satisfied patients to leave reviews of your practice, and then display them on your website, either through a Wordpress widget or by linking to your Yelp page. If you don't have many reviews yet, or are struggling with acquiring reviews, you can try partnering with a patient communication software system, such as Lighthouse 360 or Demandforce, which will help solicit patient reviews. What we like: In today’s digital world, many dental practices absolutely need to offer online appointment scheduling for patients in order to stay competitive. This can help streamline the appointment scheduling process, and provide busy patients a way to schedule appointments at their leisure, rather than having to call into your practice. However, some appointment scheduling services, such as Zocdoc, will require your visitors to book an appointment on the Zocdoc website, rather than enabling visitors to directly book directly on your website. 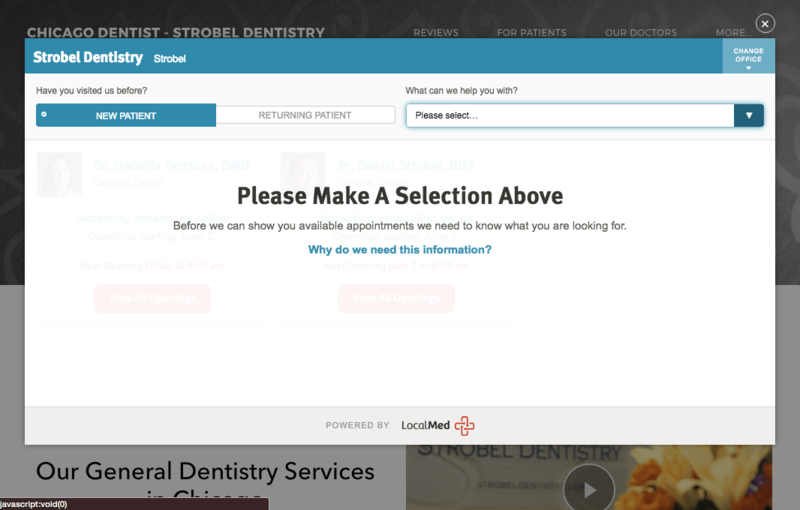 Strobel Dentistry enables visitors to set up an appointment right away without ever leaving the website, thanks to the LocalMed widget. This is a smart and strategic move, because the longer you can get people to stay on the website without navigating away, the more likely it is that you will be able to convert visitors into new patients. The takeaway: You need a simple and effective means of enabling visitors to schedule appointments right on your website. We strongly recommend offering potential and existing patients the opportunity to easily set up an appointment without leaving your website, even if that means hiring a web developer to custom-build this functionality into your website. Alternatively, you could add this functionality by partnering with a service like LocalMed. What we like: Pearl Dental NYC uses Vosmap to show new/potential patients exactly what they'll be walking into when they show up for their first appointment. The "Virtual Office" section invites visitors to take an interactive, 360-degree tour of the office. This is especially beneficial to practices that have remodeled and want to let their patients see the modern design. Using something like Vosmap can make the interior design of your practice come to life, and it also conveys the impression that your dental practice is tech-savvy and modern. This can also help put anxious patients at ease, since they know exactly what kind of environment they’ll be walking into when they show up for their appointment. The takeaway: Invite patients to take a "walk" through your office by embedding a Vosmap widget on your website. This interactive experience shows them exactly what to expect when they visit your practice. If your office does not have good natural light, this may not be a suitable option for you. However, that shouldn’t stop you from hiring a photographer to take professional pictures of your practice, which you can then display in the "About Us" section of your site. What we like: This is an attractive website with lots of rich content, including pictures of the practice’s celebrity clientele, as well as video testimonials. In addition, this practice has chosen a creative domain name (smileinla.com), which helps make the website more memorable. In this case, the practice chose a location-based domain that was playful, but still informative. In addition, if you want to help your website stand out from the crowd, a catchy domain name is an effective yet low-effort way to do that. If you’re worried about changing your website domain, you should keep in mind that it’s easy to redirect all users to the new domain, so your current patients should still able to access your new website without any glitches. A good website domain should be catchy, but also needs to convey some key information about your practice, such as the primary dentist’s name, or your location. You can check domain name services like GoDaddy, Namecheap, or Google Domains to search for available domains, and pricing. Most domains will cost about $10-15 a year. 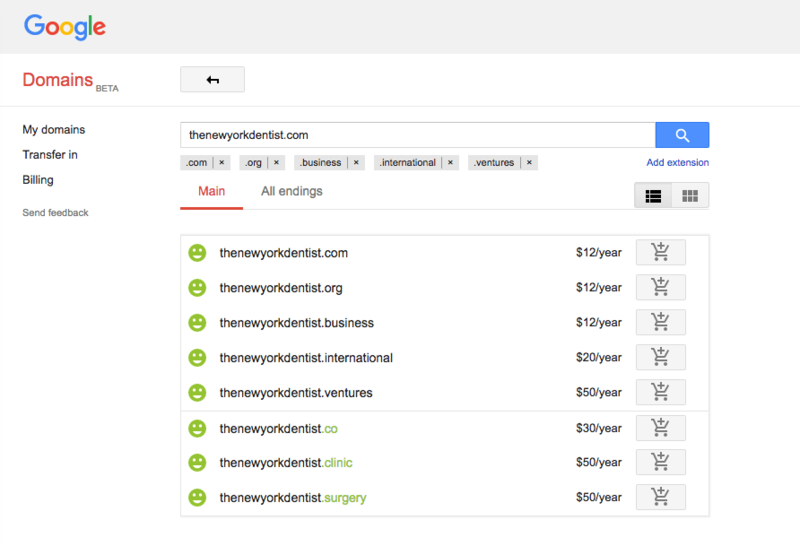 For example, if you want to see what domains are available for "thenewyorkdentist", you can see available domains and their prices. Even if your desired domain is already taken, you can try searching for a variation, or go down a different route altogether. Just remember to choose a name that isn’t too long, and is easy to remember. Taking a page from these websites' playbook will help your practice stand out from the crowd, and ultimately help convert new visitors into new patients, while leaving a positive impression on your existing patients for many years to come. Experiment with making small improvements to your website, measure the results with a tool like Google Analytics, and, most importantly, make sure that your website is effectively meeting the needs of your current and future patients.